Nuclear weapons tests are experiments carried out to determine the effectiveness, yield, and explosive capability of nuclear weapons. Throughout the twentieth century, most nations that developed nuclear weapons tested them. Testing nuclear weapons can yield information about how the weapons work, as well as how the weapons behave under various conditions and how personnel, structures, and equipment behave when subjected to nuclear explosions. Nuclear testing has often been used as an indicator of scientific and military strength, and many tests have been overtly political in their intention; most nuclear weapons states publicly declared their nuclear status by means of a nuclear test. The first nuclear device was detonated as a test by the United States at the Trinity site on July 16, 1945, with a yield approximately equivalent to 20 kilotons of TNT. The first thermonuclear weapon technology test of an engineered device, codenamed "Ivy Mike", was tested at the Enewetak Atoll in the Marshall Islands on November 1, 1952 (local date), also by the United States. The largest nuclear weapon ever tested was the "Tsar Bomba" of the Soviet Union at Novaya Zemlya on October 30, 1961, with the largest yield ever seen, an estimated 50–58 megatons. In 1963, three (UK, US, Soviet Union) of the four nuclear states and many non-nuclear states signed the Limited Test Ban Treaty, pledging to refrain from testing nuclear weapons in the atmosphere, underwater, or in outer space. The treaty permitted underground nuclear testing. France continued atmospheric testing until 1974, and China continued until 1980. Neither has signed the treaty. Underground tests in the United States continued until 1992 (its last nuclear test), the Soviet Union until 1990, the United Kingdom until 1991, and both China and France until 1996. In signing the Comprehensive Nuclear-Test-Ban Treaty in 1996, these states have pledged to discontinue all nuclear testing; the treaty has not yet entered into force because of failure to be ratified by eight countries. Non-signatories India and Pakistan last tested nuclear weapons in 1998. North Korea conducted nuclear tests in 2006, 2009, 2013, 2016, and 2017. The most recent confirmed nuclear test occurred[update] in September 2017 in North Korea. Nuclear weapons tests have historically been divided into four categories reflecting the medium or location of the test. Atmospheric testing designates explosions that take place in the atmosphere. Generally these have occurred as devices detonated on towers, balloons, barges, islands, or dropped from airplanes, and also those only buried far enough to intentionally create a surface-breaking crater. The United States, the Soviet Union, and China have all conducted tests involving explosions of missile-launched bombs (See List of nuclear weapons tests#Tests of live warheads on rockets). Nuclear explosions close enough to the ground to draw dirt and debris into their mushroom cloud can generate large amounts of nuclear fallout due to irradiation of the debris. This definition of atmospheric is used in the Limited Test Ban Treaty, which banned this class of testing along with exoatmospheric and underwater. Underground testing refers to nuclear tests conducted under the surface of the earth, at varying depths. Underground nuclear testing made up the majority of nuclear tests by the United States and the Soviet Union during the Cold War; other forms of nuclear testing were banned by the Limited Test Ban Treaty in 1963. True underground tests are intended to be fully contained and emit a negligible amount of fallout. Unfortunately these nuclear tests do occasionally "vent" to the surface, producing from nearly none to considerable amounts of radioactive debris as a consequence. Underground testing, almost by definition, causes seismic activity of a magnitude that depends on the yield of the nuclear device and the composition of the medium in which it is detonated, and generally creates a subsidence crater. In 1976, the United States and the USSR agreed to limit the maximum yield of underground tests to 150 kt with the Threshold Test Ban Treaty. Underground testing also falls into two physical categories: tunnel tests in generally horizontal tunnel drifts, and shaft tests in vertically drilled holes. Exoatmospheric testing refers to nuclear tests conducted above the atmosphere. The test devices are lifted on rockets. These high altitude nuclear explosions can generate a nuclear electromagnetic pulse (NEMP) when they occur in the ionosphere, and charged particles resulting from the blast can cross hemispheres following geomagnetic lines of force to create an auroral display. Underwater testing results from nuclear devices being detonated underwater, usually moored to a ship or a barge (which is subsequently destroyed by the explosion). Tests of this nature have usually been conducted to evaluate the effects of nuclear weapons against naval vessels (such as in Operation Crossroads), or to evaluate potential sea-based nuclear weapons (such as nuclear torpedoes or depth charges). Underwater tests close to the surface can disperse large amounts of radioactive particles in water and steam, contaminating nearby ships or structures, though they generally do not create fallout other than very local to the explosion. In conformity with treaties between the United States and the Soviet Union, a salvo is defined, for multiple explosions for peaceful purposes, as two or more separate explosions where a period of time between successive individual explosions does not exceed 5 seconds and where the burial points of all explosive devices can be connected by segments of straight lines, each of them connecting two burial points, and the total length does not exceed 40 kilometers. For nuclear weapon tests, a salvo is defined as two or more underground nuclear explosions conducted at a test site within an area delineated by a circle having a diameter of two kilometers and conducted within a total period of time of 0.1 second. The USSR has exploded up to eight devices in a single salvo test; Pakistan's second and last official test exploded four different devices. Almost all lists in the literature are lists of tests; in the lists in Wikipedia (for example, Operation Cresset has separate items for Cremino and Caerphilly, which together constitute a single test), the lists are of explosions. Separately from these designations, nuclear tests are also often categorized by the purpose of the test itself. Weapons-related tests are designed to garner information about how (and if) the weapons themselves work. Some serve to develop and validate a specific weapon type. Others test experimental concepts or are physics experiments meant to gain fundamental knowledge of the processes and materials involved in nuclear detonations. Weapons effects tests are designed to gain information about the effects of the weapons on structures, equipment, organisms and the environment. They are mainly used to assess and improve survivability to nuclear explosions in civilian and military contexts, tailor weapons to their targets, and develop the tactics of nuclear warfare. Safety experiments are designed to study the behavior of weapons in simulated accident scenarios. In particular, they are used to verify that a (significant) nuclear detonation cannot happen by accident. They include one-point safety tests and simulations of storage and transportation accidents. Nuclear test detection experiments are designed to improve the capabilities to detect, locate, and identify nuclear detonations, in particular to monitor compliance with test-ban treaties. In the United States these tests are associated with Operation Vela Uniform before the Comprehensive Test Ban Treaty stopped all nuclear testing among signatories. Peaceful nuclear explosions were conducted to investigate non-military applications of nuclear explosives. In the United States these were performed under the umbrella name of Operation Plowshare. Aside from these technical considerations, tests have been conducted for political and training purposes, and can often serve multiple purposes. Hydronuclear tests study nuclear materials under the conditions of explosive shock compression. They can create sub-critical conditions, or supercritical conditions with yields ranging from negligible all the way up to a substantial fraction of full weapon yield. Critical mass experiments determine the quantity of fissile material required for criticality with a variety of fissile material compositions, densities, shapes, and reflectors. They can be sub-critical or super-critical, in which case significant radiation fluxes can be produced. This type of test has resulted in several criticality accidents. Sub-critical (or cold) tests are any type of tests involving nuclear materials and possibly high-explosives (like those mentioned above) that purposely result in no yield. The name refers to the lack of creation of a critical mass of fissile material. They are the only type of tests allowed under the interpretation of the Comprehensive Nuclear-Test-Ban Treaty tacitly agreed to by the major atomic powers. Sub-critical tests continue to be performed by the United States, Russia, and the People's Republic of China, at least. January 1, 1960 Los Alamos National Lab Test Area 49 35°49′22″N 106°18′08″W﻿ / ﻿35.82289°N 106.30216°W﻿ / 35.82289; -106.30216 2,183 metres (7,162 ft) - 20 metres (66 ft) Series of 50 tests during US/USSR joint nuclear test ban. March 1, 1995 NTS Area U1a 37°00′41″N 116°03′35″W﻿ / ﻿37.01139°N 116.05983°W﻿ / 37.01139; -116.05983 1,222 metres (4,009 ft) - 293 metres (961 ft) Kismet was a proof of concept for modern hydronuclear tests; it did not contain any SNM (Special Nuclear Material - Plutonium or Uranium). July 2, 1997 10:--:-- NTS Area U1a 37°00′41″N 116°03′35″W﻿ / ﻿37.01139°N 116.05983°W﻿ / 37.01139; -116.05983 1,222 metres (4,009 ft) - 293 metres (961 ft) Provided information on the behavior of new plutonium alloys compressed by high pressure shock waves; same as Stagecoach but for the age of the alloys. September 18, 1997 NTS Area U1a.101A 37°00′37″N 116°03′32″W﻿ / ﻿37.01036°N 116.05888°W﻿ / 37.01036; -116.05888 1,222 metres (4,009 ft) - 290 metres (950 ft) Holog and Clarinet may have switched locations. March 25, 1998 NTS Area U1a 37°00′41″N 116°03′35″W﻿ / ﻿37.01139°N 116.05983°W﻿ / 37.01139; -116.05983 1,222 metres (4,009 ft) - 290 metres (950 ft) Provided information on the behavior of aged (up to 40 years) plutonium alloys compressed by high pressure shock waves. December 11, 1998 NTS Area U1a 37°00′41″N 116°03′35″W﻿ / ﻿37.01139°N 116.05983°W﻿ / 37.01139; -116.05983 1,222 metres (4,009 ft) - 290 metres (950 ft) Plutonium surface ejecta studies. February 9, 1999 NTS Area U1a.101C 37°00′36″N 116°03′32″W﻿ / ﻿37.01003°N 116.05898°W﻿ / 37.01003; -116.05898 1,222 metres (4,009 ft) - 290 metres (950 ft) Holog and Clarinet may have switched places on the map. March 22, 2000 NTS Area U1a 37°00′41″N 116°03′35″W﻿ / ﻿37.01139°N 116.05983°W﻿ / 37.01139; -116.05983 1,222 metres (4,009 ft) - 290 metres (950 ft) Plutonium surface ejecta studies, followup to Cimarron. August 29, 2002 19:00:-- NTS Area U1a 37°00′41″N 116°03′35″W﻿ / ﻿37.01139°N 116.05983°W﻿ / 37.01139; -116.05983 1,222 metres (4,009 ft) - 290 metres (950 ft) Plutonium surface studies (optical analysis of spall). Used wrought plutonium from Rocky Flats. September 26, 2002 19:00:-- NTS Area U1a 37°00′41″N 116°03′35″W﻿ / ﻿37.01139°N 116.05983°W﻿ / 37.01139; -116.05983 1,222 metres (4,009 ft) - 290 metres (950 ft) Plutonium surface studies (optical analysis of spall), followup to Mario. Used cast plutonium from Los Alamos. April 1, 2005 NTS Area U1a 37°00′41″N 116°03′35″W﻿ / ﻿37.01139°N 116.05983°W﻿ / 37.01139; -116.05983 1,222 metres (4,009 ft) - 190 metres (620 ft) April–May 2005, a series of mini-hydronuclear experiments interpreting Armando results. August 31, 2006 01:00:-- NTS Area U6c 36°59′12″N 116°02′38″W﻿ / ﻿36.98663°N 116.0439°W﻿ / 36.98663; -116.0439 1,222 metres (4,009 ft) - 190 metres (620 ft) "…confirm nuclear performance of the W88 warhead with a newly-manufactured pit." Early pit studies. January 1, 2007 NTS Area U1a 37°00′41″N 116°03′35″W﻿ / ﻿37.01139°N 116.05983°W﻿ / 37.01139; -116.05983 1,222 metres (4,009 ft) - 190 metres (620 ft) Feb-6 thru May 3, 2007, 12 mini-hydronuclear experiments in thermos-sized flasks. September 1, 2012 NTS Area U1a 37°00′41″N 116°03′35″W﻿ / ﻿37.01139°N 116.05983°W﻿ / 37.01139; -116.05983 1,222 metres (4,009 ft) - 190 metres (620 ft) Not even a subcrit, contained no plutonium; a dress rehearsal for Pollux. ??-? ?-2015 NTS Area U1a 37°00′41″N 116°03′35″W﻿ / ﻿37.01139°N 116.05983°W﻿ / 37.01139; -116.05983 1,222 metres (4,009 ft) - 190 metres (620 ft) Expected to be a plutonium subcritical test with a scaled down warhead mockup. There have also been simulations of the effects of nuclear detonations using conventional explosives (such as the Minor Scale U.S. test in 1985). The explosives might be spiked with radioactive materials to simulate fallout dispersal. The Phoenix of Hiroshima (foreground) in Hong Kong Harbor in 1967, was involved in several famous anti-nuclear protest voyages against nuclear testing in the Pacific. The 6,900-square-mile (18,000 km2) expanse of the Semipalatinsk Test Site (indicated in red), attached to Kurchatov (along the Irtysh river). The site comprised an area the size of Wales. The first atomic weapons test was conducted near Alamogordo, New Mexico, on July 16, 1945, during the Manhattan Project, and given the codename "Trinity". The test was originally to confirm that the implosion-type nuclear weapon design was feasible, and to give an idea of what the actual size and effects of a nuclear explosion would be before they were used in combat against Japan. While the test gave a good approximation of many of the explosion's effects, it did not give an appreciable understanding of nuclear fallout, which was not well understood by the project scientists until well after the atomic bombings of Hiroshima and Nagasaki. The United States conducted six atomic tests before the Soviet Union developed their first atomic bomb (RDS-1) and tested it on August 29, 1949. Neither country had very many atomic weapons to spare at first, and so testing was relatively infrequent (when the U.S. used two weapons for Operation Crossroads in 1946, they were detonating over 20% of their current arsenal). However, by the 1950s the United States had established a dedicated test site on its own territory (Nevada Test Site) and was also using a site in the Marshall Islands (Pacific Proving Grounds) for extensive atomic and nuclear testing. The early tests were used primarily to discern the military effects of atomic weapons (Crossroads had involved the effect of atomic weapons on a navy, and how they functioned underwater) and to test new weapon designs. During the 1950s, these included new hydrogen bomb designs, which were tested in the Pacific, and also new and improved fission weapon designs. The Soviet Union also began testing on a limited scale, primarily in Kazakhstan. During the later phases of the Cold War, though, both countries developed accelerated testing programs, testing many hundreds of bombs over the last half of the 20th century. In 1954 the Castle Bravo fallout plume spread dangerous levels of radiation over an area over 100 miles (160 km) long, including inhabited islands. Atomic and nuclear tests can involve many hazards. Some of these were illustrated in the U.S. Castle Bravo test in 1954. The weapon design tested was a new form of hydrogen bomb, and the scientists underestimated how vigorously some of the weapon materials would react. As a result, the explosion—with a yield of 15 Mt—was over twice what was predicted. Aside from this problem, the weapon also generated a large amount of radioactive nuclear fallout, more than had been anticipated, and a change in the weather pattern caused the fallout to spread in a direction not cleared in advance. The fallout plume spread high levels of radiation for over 100 miles (160 km), contaminating a number of populated islands in nearby atoll formations. Though they were soon evacuated, many of the islands' inhabitants suffered from radiation burns and later from other effects such as increased cancer rate and birth defects, as did the crew of the Japanese fishing boat Daigo Fukuryū Maru. One crewman died from radiation sickness after returning to port, and it was feared that the radioactive fish they had been carrying had made it into the Japanese food supply. Because of concerns about worldwide fallout levels, the Partial Test Ban Treaty was signed in 1963. Above are the per capita thyroid doses (in rads) in the continental United States resulting from all exposure routes from all atmospheric nuclear tests conducted at the Nevada Test Site from 1951 to 1962. Castle Bravo was the worst U.S. nuclear accident, but many of its component problems—unpredictably large yields, changing weather patterns, unexpected fallout contamination of populations and the food supply—occurred during other atmospheric nuclear weapons tests by other countries as well. Concerns over worldwide fallout rates eventually led to the Partial Test Ban Treaty in 1963, which limited signatories to underground testing. Not all countries stopped atmospheric testing, but because the United States and the Soviet Union were responsible for roughly 86% of all nuclear tests, their compliance cut the overall level substantially. France continued atmospheric testing until 1974, and China until 1980. A tacit moratorium on testing was in effect from 1958 to 1961, and ended with a series of Soviet tests in late 1961, including the Tsar Bomba, the largest nuclear weapon ever tested. The United States responded in 1962 with Operation Dominic, involving dozens of tests, including the explosion of a missile launched from a submarine. Almost all new nuclear powers have announced their possession of nuclear weapons with a nuclear test. The only acknowledged nuclear power that claims never to have conducted a test was South Africa (although see Vela Incident), which has since dismantled all of its weapons. Israel is widely thought to possess a sizable nuclear arsenal, though it has never tested, unless they were involved in Vela. Experts disagree on whether states can have reliable nuclear arsenals—especially ones using advanced warhead designs, such as hydrogen bombs and miniaturized weapons—without testing, though all agree that it is very unlikely to develop significant nuclear innovations without testing. One other approach is to use supercomputers to conduct "virtual" testing, but codes need to be validated against test data. There have been many attempts to limit the number and size of nuclear tests; the most far-reaching is the Comprehensive Test Ban Treaty of 1996, which has not, as of 2013[update], been ratified by eight of the "Annex 2 countries" required for it to take effect, including the United States. Nuclear testing has since become a controversial issue in the United States, with a number of politicians saying that future testing might be necessary to maintain the aging warheads from the Cold War. Because nuclear testing is seen as furthering nuclear arms development, many are opposed to future testing as an acceleration of the arms race. 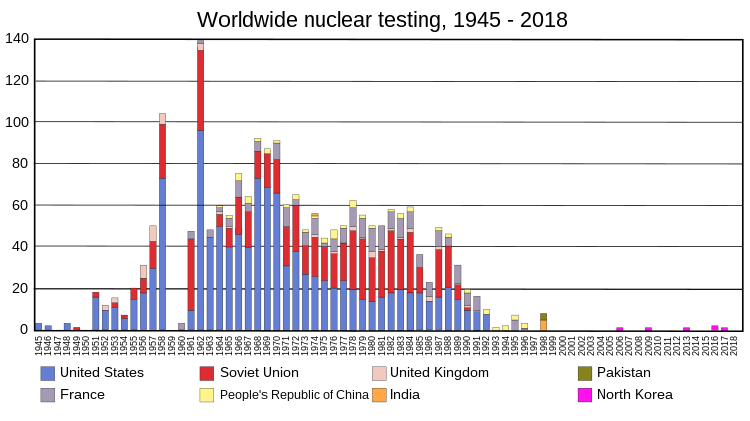 In total nuclear test megatonnage, from 1945 to 1992, 520 atmospheric nuclear explosions (including eight underwater) have been conducted with a total yield of 545 megatons, with a peak occurring in 1961–1962, when 340 megatons were detonated in the atmosphere by the United States and Soviet Union. while the estimated number of underground nuclear tests conducted in the period from 1957 to 1992 is 1,352 explosions with a total yield of 90 Mt. The first atomic test, "Trinity", took place on July 16, 1945. The Sedan test of 1962 was an experiment by the United States in using nuclear weapons to excavate large amounts of earth. United States: 1,054 tests by official count (involving at least 1,149 devices). 219 were atmospheric tests as defined by the CTBT. 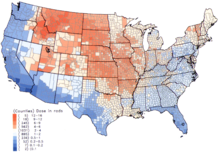 These tests include 904 at the Nevada Test Site, 106 at the Pacific Proving Grounds and other locations in the Pacific, 3 in the South Atlantic Ocean, and 17 other tests taking place in Amchitka Alaska, Colorado, Mississippi, New Mexico and Nevada outside the NNSS (see Nuclear weapons and the United States for details). 24 tests are classified as British tests held at the NTS. There were 35 Plowshare detonations and 7 Vela Uniform tests; 88 tests were safety experiments and 4 were transportation/storage tests. Link to United States' table data. Motion pictures were made of the explosions, later used to validate computer simulation predictions of explosions. North Korea: Link to North Korea's summary table North Korea is the only country in the world that still tests nuclear weapons, and their tests have caused escalating tensions between them and the United States. Their most recent nuclear test was on September 3, 2017. There may also have been at least three alleged but unacknowledged nuclear explosions (see list of alleged nuclear tests) including the Vela Incident. From the first nuclear test in 1945 until tests by Pakistan in 1998, there was never a period of more than 22 months with no nuclear testing. June 1998 to October 2006 was the longest period since 1945 with no acknowledged nuclear tests. A summary table of all the nuclear testing that has happened since 1945 is here: Worldwide nuclear testing counts and summary. The Partial Nuclear Test Ban treaty makes it illegal to detonate any nuclear explosion anywhere except underground, in order to reduce atmospheric fallout. Most countries have signed and ratified the Partial Nuclear Test Ban, which went into effect in October 1963. Of the nuclear states, France, China, and North Korea have never signed the Partial Nuclear Test Ban Treaty. The 1996 Comprehensive Nuclear-Test-Ban Treaty (CTBT) bans all nuclear explosions everywhere, including underground. For that purpose, the Preparatory Commission of the Comprehensive Nuclear-Test-Ban Treaty Organization is building an international monitoring system with 337 facilities located all over the globe. 85% of these facilities are already operational. As of May 2012[update], the CTBT has been signed by 183 States, of which 157 have also ratified. However, for the Treaty to enter into force it needs to be ratified by 44 specific nuclear technology-holder countries. These "Annex 2 States" participated in the negotiations on the CTBT between 1994 and 1996 and possessed nuclear power or research reactors at that time. The ratification of eight Annex 2 states is still missing: China, Egypt, Iran, Israel and the United States have signed but not ratified the Treaty; India, North Korea and Pakistan have not signed it. March 31, 1958 March 31, 1958 no USSR unilaterally stops testing provided the West does as well. August 2, 1958 August 2, 1958 no USA agrees; ban begins on 31 October 1958, 3 November 1958 for the Soviets, and lasts until abrogated by a USSR test on 1 September 1961. December 1, 1959 June 23, 1961 yes Bans testing of all kinds in Antarctica. August 5, 1962 October 10, 1963 yes Ban on all but underground testing. January 27, 1967 October 10, 1967 yes Bans testing on the moon and other celestial bodies. February 14, 1967 April 22, 1968 yes Bans testing in South America and the Caribbean Sea Islands. January 1, 1968 March 5, 1970 yes Bans the proliferation of nuclear technology to non-nuclear nations. February 11, 1971 May 18, 1972 yes Bans emplacement of nuclear weapons on the ocean floor outside territorial waters. January 1, 1972 no A five-year ban on installing launchers. May 26, 1972 August 3, 1972 no Restricts ABM development; additional protocol added in 1974; abrogated by the USA in 2002. June 22, 1973 June 22, 1973 yes Promises to make all efforts to promote security and peace. July 1, 1974 December 11, 1990 yes Prohibits higher than 150 kt for underground testing. January 1, 1976 December 11, 1990 yes Prohibits higher than 150 kt, or 1500kt in aggregate, testing for peaceful purposes. January 1, 1979 January 1, 1984 no Bans use and emplacement of nuclear weapons on the moon and other celestial bodies. June 18, 1979 no Limits strategic arms. Kept but not ratified by the US, abrogated in 1986. August 6, 1985 ? Bans nuclear weapons in South Pacific Ocean and islands. US never ratified. December 8, 1987 June 1, 1988 yes Eliminates Intermediate Range Ballistic Missiles (IRBMs). Implemented by 1 June 1991. Both sides allege the other is in violation of the treaty. November 19, 1990 July 17, 1992 yes Bans categories of weapons, including conventional, from Europe. Russia notified signatories of intent to suspend, 14 July 2007. July 31, 1991 December 5, 1994 no 35-40% reduction in ICBMs with verification. Treaty expired 5 December 2009, renewed (see below). March 24, 1992 January 1, 2002 yes Allows for unencumbered surveillance over all signatories. October 2, 1992 October 2, 1992 no George. H. W. Bush declares unilateral ban on nuclear testing. Extended several times, not yet abrogated. January 3, 1993 January 1, 2002 no Deep reductions in ICBMs. Abrogated by Russia in 2002 in retaliation of US abrogation of ABM Treaty. December 15, 1995 March 28, 1997 yes Bans nuclear weapons from southeast Asia. January 1, 1996 July 16, 2009 yes Bans nuclear weapons in Africa. September 10, 1996 yes (effectively) Bans all nuclear testing, peaceful and otherwise. Strong detection and verification mechanism (CTBTO). US has signed and adheres to the treaty, though has not ratified it. May 24, 2002 June 1, 2003 no Reduces warheads to 1700-2200 in ten years. Expired, replaced by START II. April 8, 2010 January 26, 2011 yes Same provisions as START I. Over 500 atmospheric nuclear weapons tests were conducted at various sites around the world from 1945 to 1980. As public awareness and concern mounted over the possible health hazards associated with exposure to the nuclear fallout, various studies were done to assess the extent of the hazard. A Centers for Disease Control and Prevention/ National Cancer Institute study claims that nuclear fallout might have led to approximately 11,000 excess deaths, most caused by thyroid cancer linked to exposure to iodine-131. United States: Prior to March 2009, the U.S. was the only nation to compensate nuclear test victims. Since the Radiation Exposure Compensation Act of 1990, more than $1.38 billion in compensation has been approved. The money is going to people who took part in the tests, notably at the Nevada Test Site, and to others exposed to the radiation. France: In March 2009, the French Government offered to compensate victims for the first time and legislation is being drafted which would allow payments to people who suffered health problems related to the tests. The payouts would be available to victims' descendants and would include Algerians, who were exposed to nuclear testing in the Sahara in 1960. However, victims say the eligibility requirements for compensation are too narrow. United Kingdom: There is no formal British government compensation program. However, nearly 1,000 veterans of Christmas Island nuclear tests in the 1950s are engaged in legal action against the Ministry of Defense for negligence. They say they suffered health problems and were not warned of potential dangers before the experiments. Russia: Decades later, Russia offered compensation to veterans who were part of the 1954 Totsk test. However, there was no compensation to civilians sickened by the Totsk test. Anti-nuclear groups say there has been no government compensation for other nuclear tests. China: China has undertaken highly secretive atomic tests in remote deserts in a Central Asian border province. Anti-nuclear activists say there is no known government program for compensating victims. The following list is of milestone nuclear explosions. In addition to the atomic bombings of Hiroshima and Nagasaki, the first nuclear test of a given weapon type for a country is included, and tests which were otherwise notable (such as the largest test ever). All yields (explosive power) are given in their estimated energy equivalents in kilotons of TNT (see TNT equivalent). Putative tests (like Vela Incident) have not been included. 1945-08-06 Little Boy 12–18 USA Bombing of Hiroshima, Japan, first detonation of a uranium gun-type device, first use of a nuclear device in combat. 1945-08-09 Fat Man 18–23 USA Bombing of Nagasaki, Japan, second detonation of a plutonium implosion device (the first being the Trinity Test), second and last use of a nuclear device in combat. 1957-05-31 Orange Herald 720 UK Largest boosted fission weapon ever tested. Intended as a fallback "in megaton range" in case British thermonuclear development failed. "Staging" refers to whether it was a "true" hydrogen bomb of the so-called Teller-Ulam configuration or simply a form of a boosted fission weapon. For a more complete list of nuclear test series, see List of nuclear tests. Some exact yield estimates, such as that of the Tsar Bomba and the tests by India and Pakistan in 1998, are somewhat contested among specialists. ^ Universal Time at the Nevada National Security Site is 8 hours after local time; UT dates are one day after local date for UT times after 16:00. ^ "The Treaty has not been signed by France or by the People's Republic of China." U.S. Department of State, Limited Test Ban Treaty. ^ For an overview of the preparations and considerations used in underground nuclear testing, see ""Underground Nuclear Weapons Testing" (Globalsecurity.org)". Retrieved 2006-10-19. For a longer and more technical discussion, see U.S. Congress, Office of Technology Assessment (October 1989). The Containment of Underground Nuclear Explosions (PDF). Washington, D.C.: U.S. Government Printing Office. Archived from the original (PDF) on 2013-02-27. Retrieved 2018-12-24. ^ Yang, Xiaoping; North, Robert; Romney, Carl; Richards, Paul R. "Worldwide Nuclear Explosions" (PDF). ^ Medalia, Jonathan (2005-03-11). "Nuclear Weapons: Comprehensive Test Ban Treaty" (PDF) (IB92099). Congressional Record Service. Retrieved 2013-12-09. ^ "US conducts 'subcritical' nuclear test". zeenews.india.com. 2012-12-07. Retrieved 2013-05-28. ^ Thomas Nilsen (2 October 2012). "Subcritical nuke tests may be resumed at Novaya Zemlya". barentsobserver.com. Retrieved 2017-07-13. ^ Papazian, Ghazar R.; Reinovsky, Robert E.; Beatty, Jerry N. (2003). "The New World of the Nevada Test Site" (PDF). Los Alamos Science (28). Retrieved 2013-12-12. ^ Thorn, Robert N.; Westervelt, Donald R. (February 1, 1987). "Hydronuclear Experiments" (PDF). LANL Report LA-10902-MS. Retrieved December 9, 2013. ^ Conrad, David C. (July 1, 2000). "Underground explosions are music to their ears". Science and Technology Review. Retrieved 9 December 2013. ^ "Nevada Test Site: U1a Complex subcritical experiments". DOE Nevada. Department of Energy. 2003-02-01. ^ a b Pavlovski, O. A. (1 January 1998). "Radiological Consequences of Nuclear Testing for the Population of the Former USSR (Input Information, Models, Dose, and Risk Estimates)". Atmospheric Nuclear Tests. Springer, Berlin, Heidelberg. pp. 219–260. doi:10.1007/978-3-662-03610-5_17. ISBN 978-3-642-08359-4. ^ "Radioactive Fallout - Worldwide Effects of Nuclear War - Historical Documents". Atomciarchive.com. ^ "United States Nuclear Tests: July 1945 through September 1992" (PDF). Las Vegas, NV: Department of Energy, Nevada Operations Office. 2000-12-01. Archived from the original (PDF) on 2006-10-12. Retrieved 2013-12-18. This is usually cited as the "official" US list. ^ Long, Kat. "Blasts from the Past: Old Nuke Test Films Offer New Insights [Video]". Scientific American. Retrieved 2017-04-24. ^ "USSR Nuclear Weapons Tests and Peaceful Nuclear Explosions 1949 through 1990". Sarov, Russia: RFNC-VNIIEF. 1996. The official Russian list of Soviet tests. ^ Mikhailov, Editor in Chief, V.N. ; Andryushin, L.A.; Voloshin, N.P. ; Ilkaev, R.I.; Matushchenko, A.M.; Ryabev, L.D. ; Strukov, V.G. ; Chernyshev, A.K. ; Yudin, Yu.A. "Catalog of Worldwide Nuclear Testing". Archived from the original on 2013-12-19. Retrieved 2013-12-28. An equivalent list available on the internet. ^ "UK/US Agreement". Archived from the original on 2007-06-07. Retrieved 2010-10-21. ^ "N° 3571.- Rapport de MM. Christian Bataille et Henri Revol sur les incidences environnementales et sanitaires des essais nucléaires effectués par la France entre 1960 et 1996 (Office d'évaluation des choix scientifiques et technologiques)". Assemblee-nationale.fr. Retrieved 2010-10-21. ^ "Nuclear Weapons Test List". Fas.org. Retrieved 22 September 2018. ^ U.S. Department of State, Limited Test Ban Treaty. ^ "CTBTO Factsheet: Ending Nuclear Explosions" (PDF). Ctbto.org. Retrieved 2012-05-23. ^ "Status of signature and ratification". Ctbto.org. Retrieved 2012-05-23. ^ "The Status of the Comprehensive Test Ban Treaty: Signatories and Ratifiers". Arms Control Association. March 2014. Retrieved June 29, 2014. ^ Council, National Research (11 February 2003). Exposure of the American Population to Radioactive Fallout from Nuclear Weapons Tests: A Review of the CDC-NCI Draft Report on a Feasibility Study of the Health Consequences to the American Population from Nuclear Weapons Tests Conducted by the United States and Other Nations. doi:10.17226/10621. ISBN 9780309087131. PMID 25057651. ^ a b c d e News, A. B. C. "International News: Latest Headlines, Video and Photographs from Around the World -- People, Places, Crisis, Conflict, Culture, Change, Analysis and Trends". Abcnews.go.com. ^ "Radiation Exposure Compensation System: Claims to Date Summary of Claims Received by 06/11/2009" (PDF). Usdoj.gov. Gusterson, Hugh. Nuclear Rites: A Weapons Laboratory at the End of the Cold War. Berkeley, CA: University of California Press, 1996. Hacker, Barton C. Elements of Controversy: The Atomic Energy Commission and Radiation Safety in Nuclear Weapons Testing, 1947–1974. Berkeley, CA: University of California Press, 1994. Schwartz, Stephen I. Atomic Audit: The Costs and Consequences of U.S. Nuclear Weapons. Washington, D.C.: Brookings Institution Press, 1998. Weart, Spencer R. Nuclear Fear: A History of Images. Cambridge, MA: Harvard University Press, 1985. Wikimedia Commons has media related to Nuclear weapon tests. What About Radiation on Bikini Atoll?